Map, based on actual survey, containing the Sanford Ore Bed, offices of the American Mine Company, other ore beds, roads and streams. 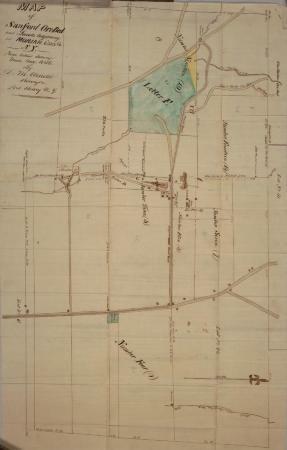 Map is part of 1857 mortgage - American Mineral Company to Robert M. Stratton. Scale indeterminable. Source: Adirondack Museum Library, Patrick F. Farrell collection, box 1, folder 5.